In the run up to the 2017 European Varela Awards we highlight some of the work of our 2016 awardees. 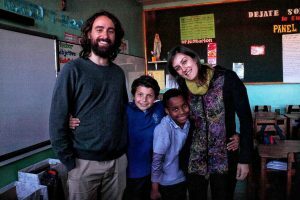 Carlos Garcia Rubio and Catherine Andreu received a European Varela award for their research into the effect mindfulness in schools has on the self-regulation abilities of children living in highly vulnerable areas in Latin-America. The main objective of our project is to evaluate the impact of a mindfulness-based intervention on executive functions in a vulnerable school context with 9 and 10 year old children. Specifically, we areinterested in the effect that mindfulness in schools could have on the self-regulation abilities in children who live in contexts of high vulnerability in Latin America. 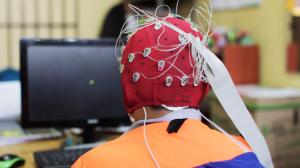 To study this, we use different methodologies, including self-report measures, computerized test assessments and measurements with Electroencephalography (EEG) to observe possible brain changes. To date, there are very few studies investigating the impact of mindfulness on children at the brain level with rigorous methodological designs. We also included interviews with children to deepen the understanding of their experience. Why have you chosen these methodologies? It is a randomized study with an active control group. We are using EEG measures to study the neuronal effects, as well as behavioral-cognitive tests, self-report measures (for children, teachers and parents) and qualitative data from child interviews. Taking into account that not all evaluation methods can be sensitive to recording the impact of the intervention, we have tried to evaluate from a wide set of methodologies that can help to provide more precise information. In addition, we are comparing the mindfulness-based intervention with an active control group of a programme of social skills that is implemented in many Chilean high vulnerability schools in the usual curriculum. Thus, we can see if the practice of mindfulness has any specific effect and brings something differential. Can you tell a more about the children you are researching? Scientific literature has consistently shown that the ability to self-regulate during childhood is a good predictor of higher well-being, better social relationships and in general greater success in adolescence and adulthood. Our research is aimed at studying the effect of mindfulness practice with Latin-American children (a heavily under-researched group) that are in a situation of high social vulnerability. 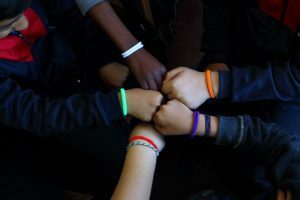 There are approximately 140 children between 9 and 11 years old who are part of a school in a poor neighborhood of Santiago de Chile. In the index that classifies the social vulnerability of Chilean schools (ranging from 0% to 100%, where 100% is the highest vulnerability), the school that is part of the research has a high index of social vulnerability of 78%. This means that the families of the children who attend the school have many economic difficulties and very few resources, there is more immigration, and school performance is below average. This school is indicative of a greater social problem. How are the children responding to your research? During the evaluation and the intervention, we experienced difficulty in implementing the practice of mindfulness in this a high-vulnerability context. Although it is too early to talk about results, children started the session with openness and high motivation. However, it has been rather hard for the children to carry out some of the practices (especially the attentional practices). Mindfulness practices can be quite demanding for children who have attention and self-regulatory problems and that are part of a disruptive classroom environment. It is therefore important to reflect deeply on how to best implement this type of research in more vulnerable contexts. How are their caretakers responding to your research? The experience with the teachers has been positive. They try to be involved in the research and collaborate with us. Mindfulness practices (e.g. Breathing space) helped them to take a moment of reflection before the class started. Parents in at-risk contexts are not always involved in what their children do. They know what the research is about and are trying to get involved in the research by helping us with some questionnaires. Some of them are very interested in the project, especially because some children share the mindfulness practices they learned with their families. Were there any obstacles you had to overcome to start your research with these children? Children are never the problem. A more vulnerable social context makes it difficult to implement this type of research project and intervention. However, it is also because of this context that people appreciate it. The challenges are linked to being able to implement the practice of mindfulness in a disruptive classroom environment. What we’re asking from them is rather revolutionary. We realized that more durable and longer-term systematic intervention periods are probably needed to ensure that the effects are more sustainable over time. We need to study the most appropriate and effective way of implementing mindfulness practices in these type of schools. What results are you seeing so far? Until now, we have collected almost all the data of post-measurement, but we still need to analyze it. It is still too early to determine the results, but some children have mentioned during the interviews that mindfulness has helped them to better control their impulses, and to better manage emotions like anger or frustration. Most of the children are really grateful for the opportunity to learn mindfulness. Also, teachers see the benefits of having mindfulness lessons in their school. Children are using breathing practices to calm down in challenging situations and some have shared these with their families. They also told us how much they value the kindness activities at the end of the mindfulness programme. This has taught them the importance of taking care of each other and of themselves. How will you promote your research findings? Our research can help us elucidate how mindfulness practice can be useful in vulnerable schools and to reflect on the best way to implement it effectively in a secure and responsible way. We would also like our research to serve as an impetus for studying the effects of mindfulness practice beyond the usual contexts (USA, Canada, UK, the Netherlands, etc.). For example, there is almost no research done in Hispano-American countries. When the global community becomes engaged, we are sure that more children in different parts of the world will benefit from contemplative practices. Do you have a call-to-action for educators based on your research? Implementing mindfulness in the classroom in a correct way is not an easy task. Teachers that are interested in bringing the practice of mindfulness to their school need training to understand what mindfulness means and how to transmit it to children. Although there are now many games and activities available to bring mindfulness to children, we don’t think this is the right way. Although it is important to understand “what” to do, it is more important to know “how” to do it. It is how a teacher leads a mindfulness-based intervention that helps children understand what mindfulness is. To cultivate this state of presence in the classroom requires proper training.